By Scott Gilfoid: Surprise, surprise, Oscar De La Hoya came out in an interview today on Univision talking about his recent drug and alcohol past. It looks De La Hoya was doing a little dabbling with Cocaine, but his real drug of choice was alcohol, he said. 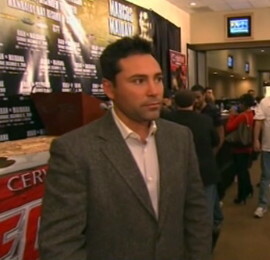 Here’s what De La Hoya said in the interview: “There were drugs, my drug of choice was cocaine and alcohol. Cocaine was recent. The last two, last two one-half years and I depended more in the alcohol than the cocaine. De La Hoya is now clean, and that’s good for him. It’s not a big deal because the man is retired and no longer fighting. It doesn’t look like he was doing more than recreational use of either drug, because he was still functioning in his job with Golden Boy Promotions. De La Hoya has since attended alcohol and drug treatment and has been clean for the past few months. Thank god he didn’t do it. With the money that De La Hoya has and the great career he’s been blessed with, it would be such a waste for the guy to end it. A lot of guys would love to be in his shoes. « Would Muhammad Ali have lost a rematch against George Foreman?